What a year 2012 was for wet weddings! I don’t think my white umbrellas have been used as much as they were last year! I always have them with me just in case, but most of the time they remain in my car, dry! I expect to have the odd bit of rain of course, but nothing like what some of my 2012 couples had to endure. 2012 was the wettest ever year in England, and the second wettest year on record in the UK!! The exceptionally wet year began with a very dry spell and water companies imposing a widespread hosepipe ban. But a deluge followed as the 5th driest and 3rd warmest March on record gave way to the wettest April on record. We then experienced the wettest April to June on record, with June itself being the wettest June on record. 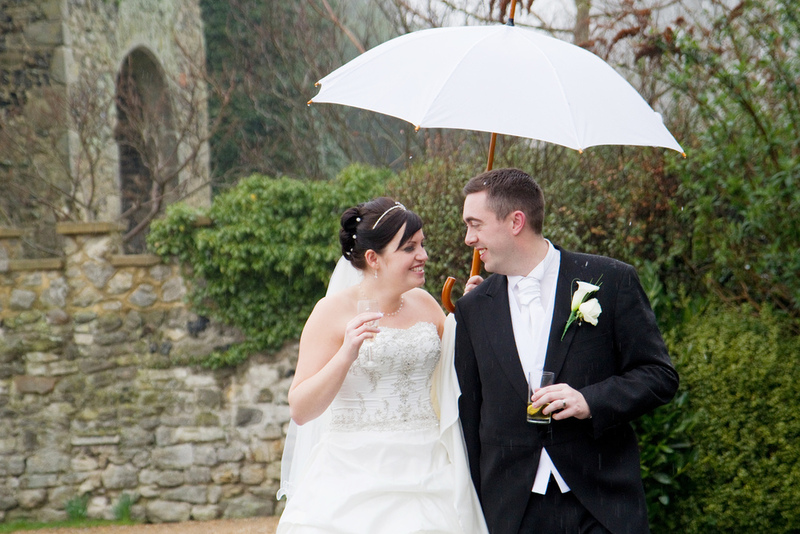 Hoping for a dryer, sunnier 2013, my first wedding of the year was probably the wettest wedding I have ever experienced! It did not stop all day! Sarah & Daniel did not let that spoil their celebrations though and despite the rain it was a beautiful, happy day. Planning what to do before hand, and having a back up plan for wet weather ensures that couples still have the day they planned, and photography up to the standards they expect. Weather repots to my phone, group shots inside, making good use of umbrellas, wellies, doorways, windows and gazebos, all help me get the shots I need. I might get wet but as long as the bride & groom stay as dry as possible I will do what ever I can to get the best photographs. It’s all part of the job and it’s the planning that goes into it that helps make it work on the day.